Does your life as an African American in the USA seem a bit insane? Are you asking yourself questions and having racial encounters every day about which white folks have no clue? This book lets you know that you're neither crazy nor alone. In addition, if you're a white person seeking to show up as an accomplice to African Americans, you'll gain precious clues as you witness real-life scenarios you may otherwise have never known. In the tradition of Langston Hughes' final work, Black Misery, author/cultural liberationist, Anika Nailah, shares 30 common moments in 21st Century Black American life. 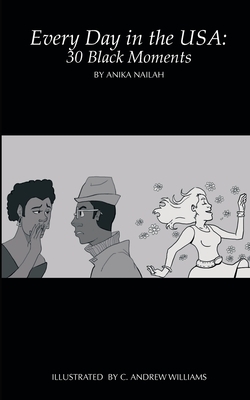 C. Andrew Williams' humorous yet poignant black and white illustrations enhance those scenarios to create the Everyday in the USA: 30 Black Moments experience of an undisguised portrayal of life in Black America. The unapologetic, intimate, and ironic tone will feel familiar to African Americans, while quite eye-opening to white readers, perfectly serving as a catalyst to spearhead thoughtful cross-racial and African American community conversations. The Ready to Go Deeper Anti-Racism Guide at the back of the book also provides 31 activities for using the book to help you not only examine individually, in workplaces, in neighborhoods, and other group settings, crucial and urgent questions about racial oppression, but offers concrete steps you can take to turn reflection into active interruption of racism in the United States of America.